Powers/Abilities: Hercules is exceptionally strong, nearly superhumanly so. He is able to withstand extreme cold with ease. Hercules is also a scientific genius. 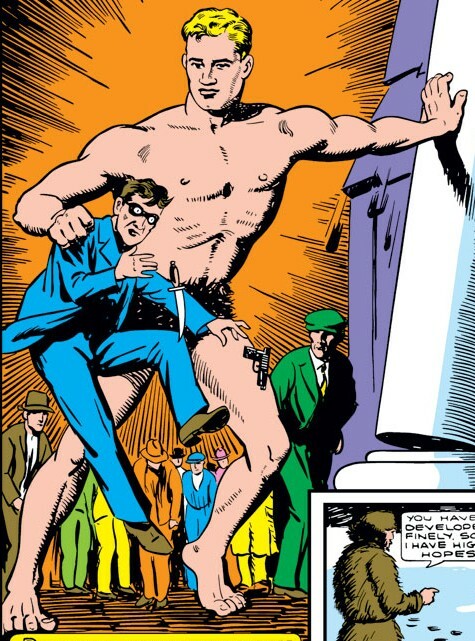 History: (Mystic Comics #3) Raised in isolation by his scientist father, Hercules grew up on Snow Island in the Arctic. Thanks to his father's care, he grew up strong in both mind and body, standing nearly ten feet tall. After the death of his father, he stayed on his remote island until a couple of circus men hear rumours of him, leading them to him. They kidnap him, believing he will make a top attraction back in civilisation. 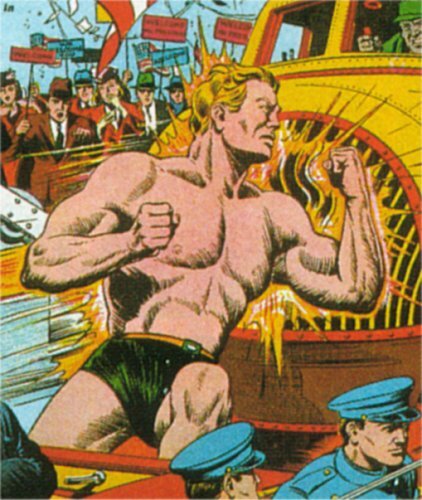 Marketing him as "Hercules", their estimation proves to be correct, as he draws in the crowds. After he saves a reporter's life from a rampaging bull, she suggests he use his immense strength for a greater good. Leaving the circus (without the unhappy owner's permission), Hercules saves the town from being submerged by a flood from a burst dam, and then sets out to end crime too. (Mystic Comics #4) Next Hercules battled Lemo, an evil inventor. Comments: In spite of his immense strength and height, there is nothing to suggest Hercules is anything more than a regular, if exceptional, human.